Have you ever had a great sweater that was just a little plain? Perhaps you've crocheted a simple scarf, and you'd like it to be a little fancier? While it's possible to work designs into knit and crochet wear as they are created, that's not the only way to add motifs to these kinds of pieces. Embroidery is the solution you're looking for! The principle for accomplishing this is the same as any other kind of hand embroidery. There are just a few things to keep in mind as you get started. To start, you will need a knitted or crocheted item. It can be handmade or pre-made but choose something that has a tighter or more solid knit. A more open knit can be difficult to embroider. The hat shown here has a fine knit, as well as a jersey knit lining. Any embroidery thread can work for this, but choosing one with a weight and fiber content similar to what you are stitching on is helpful, especially if the item will need to be washed. For chunkier knits, try using the yarn for your stitching. Crewel wool would also work well on a fine knit. When choosing a pattern to work with, start with something simple. If you feel more comfortable, then you may select something with more details, or add them yourself. 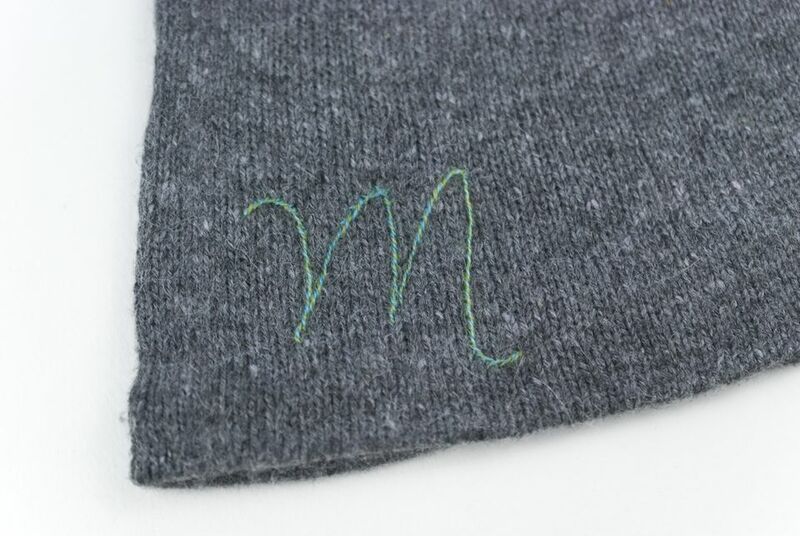 The "M" pattern in the example is from the free monogram pattern set. One of the biggest challenges in working on a knit item is transferring the pattern. The tracing paper or water-soluble stabilizer methods are best for this. If at all possible, work without a hoop. Placing the item in a hoop can stretch the knitted material and misshape it. Stitch through the material and the knitwear as you would with any other embroidery, but avoid pulling the stitches too tight. Most items like this need to have a bit of stretch, and making the stitches tight would prevent that. After you've finished stitching, tear away the tissue paper or soak away the stabilizer. If soaking, gently squeeze out the excess water with a towel, then lay the knitwear flat to dry. A simple monogram can be completed in an evening, which means you'll have a special item in hardly any time at all. You won't even need to learn how to knit or crochet! Before long you'll be looking for more knit and crochet pieces to add your embroidered mark. After you've exhausted your closet, check thrift stores for great finds. You can also work without a pattern, and freehand embellish your work. Artist Dottie Angel creates beautiful work this way, which she refers to as "Wooly Tattoos."